The Barth VakuuCar XL is a large, robust mobile workstation with built-in vacuum clamping. 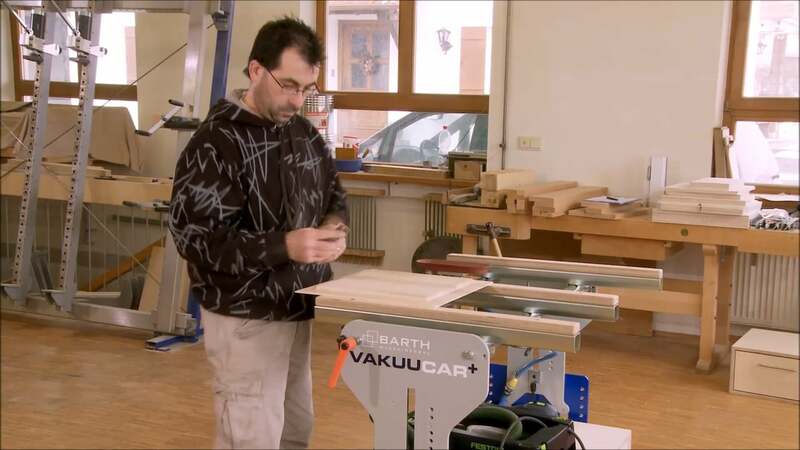 With the VakuuCar XL, your bench can move around with you, and handle and clamp any material at the height and position you want it at. This time and space-saving cart enables you to get the most out of your time in the shop. This model features more worktop area for heavy-duty shop use. This option adds a 400mm extension tube equipped with a spindle clamp on the end. These strips fit in to laterally extend your worktop surface, with a padded top that won't scratch your piece. These extensions fit securely into your table and can be added or removed with a handle. This flanged tube slots into the extension rail on your VakuuCar, and supports your vacuum suction cups to clamp up to 900 mm higher than the table surface. This accessory works with the mounting extension rail. It allows you to position the vacuum heads freely in 3 dimensions, and lock them in place in the ideal position. It can slot into the BH-16-93 extension rails, or fit directly into the ports on your table. This option adds two stacked drawers to your VakuuCar, under the table surface. The dimensions are 460 x 450 x 500 mm. This option adds a metal side tray for holding loose tools to the VakuuCar. This unit contains two length extension rails for the VakuuCar XL. The rails have carpeted tops to project your workpiece, and can adjust in or out to the length you need. Each adds a maximum of 450 mm to its side of the table. Designed and made in Germany, Barth VakuuCar XL work stations are built with exceptional engineering to save shop time and money in hand-working and moving all types of work pieces. The VakuuCar XL has 33% more worktop surface area than the standard VakuuCar+. With its adjustable surfaces and easy-to-operate foot pedal clamping, it also provides better ergonomic positions for woodworkers, especially when clamping awkward shapes, nonstandard materials, or pieces ordinarily too large for one person to handle. The XL model we offer features the easyMOTION height-adjustable with a crank handle to adjust the height of the worktop. All models feature adjustable heights for the rubber-protected vacuum clamps, which are operated effortlessly with a pedal-valve vacuum clamping system that can hold all materials, shapes, and sizes with a powerful hold. Even heavy solid-wood doors or panels can be held firmly by the vacuum clamps. While the grip is firm, the clamp pads won't scratch or damage your workpiece; clamping materials like glass with no risk of scratches or breaking provides you with new possibilities and time savings.The Easy Motion system adds a foot pedal-operated hydraulic lift element to the table to raise or lower the tabletop. The VakuuCar+ is one of the most innovative workstations available, saving both time and your health.